It’s a Kentucky Fried home invasion. ASK US ON a dodgy Sunday morning and we’d tell you we’d love a giant bucket of fried chicken to arrive at our doorstep. That’s more or less what happened to Georgia woman Aleena Headrick last week when a 7-foot-tall bargain bucket mysteriously landed in her garden. Headrick told local news station WAGT that she thought she was hallucinating when she drove by her house and saw the bucket. She called her kids at home to check, as of course, a towering KFC bucket would be hard to spot. She has no idea where it came from, but it has since been revealed that the owner is her landlord, Freddie Taylor. Taylor collects signs such as this one, and estimates that the mammoth takeaway is an antique. 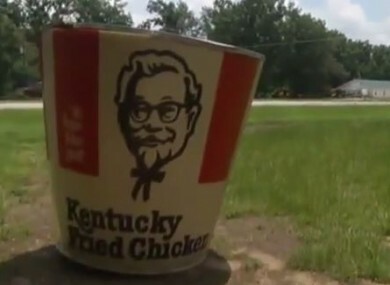 That bucket right there, if you notice it, it don’t say KFC. It says Kentucky Fried Chicken. That bucket’s probably 40 years old. He plans to mount it on a pole to make it even more visible, and while Headrick isn’t pleased, she says it’ll make for easy directions to her house. You can just say come down to the KFC bucket and turn right. The bucket is fast becoming a popular landmark, with people even stopping to take pictures of it. But imagine the wrath of angry chicken fans turning up once they realise there’s no KFC on site. Considering Headrick confirms that there’s no chicken inside her new garden ornament, they’ll have to make the trek to the closest restaurant which is 5 and a half miles away. Email “What's a seven-foot KFC bucket doing in this woman's garden?”. Feedback on “What's a seven-foot KFC bucket doing in this woman's garden?”.